FINAL SPACING: Probably shouldn’t plant in most cases. Male tree in flower in the spring. NATURAL HABITAT AND PREFERRED SITE: Needs full sun. Bois D’ Arc is native to Oklahoma, Louisiana, Missouri, and Texas and plentiful throughout the Red River Valley. It favors stream bottoms and low areas and can become a weedy invader of disturbed land. Bois d’ arc is well known for growing in fence rows and has been widely used as a windbreak plant because of its tendency to form thickets. Bois d’ Arc does better in deep soils with more moisture than the very shallow rocky soils. According to Benny Simpson’s book A Field Guide to Texas Trees, it is difficult to tell where the plant is native because it has been planted in so many areas. Bois d’ arc reaches its largest size in the Red River and Trinity River Valleys in northern Texas. It is definitely native to the Great Blackland Prairies of Texas. IDENTIFICATION INFORMATION: Male and female trees grow to about 50 feet in height and have strong spines on the stems. Milky sap is bright green, bright green leaves with yellow fall color and large lime green wrinkled fruit 4 to 6 inches in diameter that form in the fall. You can often see bois d’ arc leaning over in landscape situations because the root system has failed. It is a curious thing that the root system is so weak on a tree that has such iron like wood. The horse apples form on the female plants only. FLOWERS AND FRUIT: The insignificant flowers form in the spring from April to June. 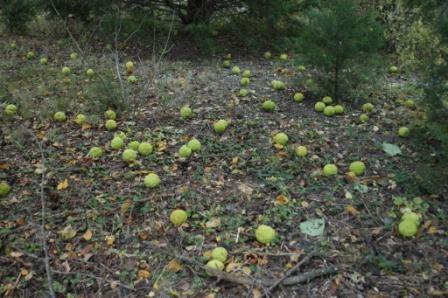 The fruit is the large horse apple that looks a little bit like a lime green brain 4 to 6 inches in diameter. It is loaded with juice that is milky and acid. BARK: The bark is brown to orange – usually deeply furrowed with rounded ridges often interlacing. 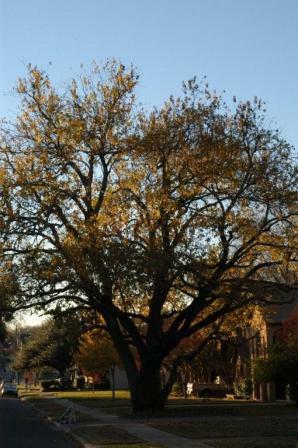 FOLIAGE: The leaves are broad and pointed with yellow fall color forming rather dense shade below the tree. CULTURE: Bois d’ arc is curious in that it grows very fast and easily, almost weed like, but it is sometimes hard to keep healthy and alive in landscaping. Large chunks of the tree will often die and borers frequently attack the iron-like wood causing further problems. The root system seems shallow and not durable. It does not need very much water although deep soils are much better than shallow rocky soils. It needs little to no fertilizer. PROBLEMS: It is a very messy tree to try to have in a maintained garden. Problems include borers, shallow root system, wind damage, trees falling over in wet soils and other related immune system problems. PROPAGATION: Very easy, can be grown from stem cuttings cut from branches or rather large limbs. Can also be grown from the fruit. The fruit can be crushed and the seed after drying can be stratified by soaking in water for 30 days and then planted in the spring. According to Vine’s Trees, Shrubs, and Woody Vines of the Southwest a bushel of fruit will yield approximately 24,500 seeds weighing about 2 pounds and if stored at 41 degrees, the seeds will retain viability for 3 years or more. INSIGHT: The Native American Osage Indians used bois d’ arc to make bows hence the name, and also war clubs. The invention of barbed wire reportedly came from someone seeing the thorns on the bois d’ arc fencerows. The fruit or horse apples have been historically used to repel cockroaches and fleas. Horses actually do eat the fruit, which has caused deaths due to lodging in the animal’s throat. Some people are allergic to the milky sap from the stems, leaves and fruit and develop dermatitis. Foliage has been used to feed silkworms and a yellow die has been made from the root bark. The bark of the trunk has been used for tanning leather. In landscape situations bois d’arc generally should be removed to favor more desirable plants. The bright orange wood can be used for fenceposts and construction material because it takes forever to rot. I have received several reports that bois 'd arc fruit (horse apples) do in fact repel roaches and other pests. Most people use the entire fruit without cutting in half. It's interesting that squirrels certainly aren't repelled by them. They apparently love the taste. The use of the hedge apples for insect control is one of the most enduring pest management home remedies. Placement of hedge apples around the foundation or inside the basement is claimed to provide relief from cockroaches, spiders, boxelder bugs, crickets and other pests. Although insect deterrent compounds have been extracted from hedge apples in laboratory studies, these do not provide a logical explanation about why hedge apples would work as claimed. Scientific studies have found that extracts of Osage orange do repel several insect species. Various studies have found elemol, an extract of Osage orange, to repel several species of mosquitoes, cockroaches, crickets, and ticks. One study found elemol to be as effective a mosquito repellent as DEET. Sounds like a business opportunity for those with lots of bois 'arc trees. In addition most homeowners wouldn't mind entrepreneurs cleaning up their yards.